Ask The Bellwether: How fast can you knit? How fast can you knit? The re-spun yarn sweater, progresses. But at Madrona this last weekend I was stunned to learn there's a way to knit not taught in books. Eeek! And to make matters worse for Ms. Efficiency (that would be me), it's faster -- once you've really learned it -- than all my efficiency-in-motion studies on my own knitting. Me -- 32 stitches a minute, throwing (English style). Picking (Continental), about the same, really. I knit whichever way my wrists say is less stressful at the time, which means 10 minutes in, I switch styles. That helps keep both wrists limber and happy - yay! UK's fastest knitter ... seeing anything in common yet? The world's fastest knitter, from the Netherlands, 118 stitches a minute. Notice, they are all holding one needle steady. And all have minimized their movements. Miriam Tegels has her yarn in her left hand while the others have their yarn in their right. This style of knitting has a name -- Lever Knitting. Also sometimes called Irish Cottage Knitting. And, I'm learning it. The class at Madrona was taught by none other than Stephanie Pearl-McPhee, who very graciously showed us how to do this, and in the process gave us tips for improving our regular knitting (an SSK in one stitch? wow! and it's prettier, too!) Her basis is the yarn in the right hand. If you want to try an on-line lesson, KnitPicks has Miriam Tegels showing her yarn in the left hand version here and teaching to a student here. Stephanie Pearl-McPhee's advice was to keep at it every day for 28 days. I'm now 4 days into my own lever knitting journey -- only 24 left to go -- the motions are getting smoother, I expect to see them getting smaller soon as well. 50 stitches a minute, here I come! I'm trying to "retrain" as well. But I slip back into throwing when I hit a patterned part of my knitting. I should just do straight stockinette until I get the hang of it! I tested at 40 stitches per minute, but the gal across from me kept beating me by 1 stitch per minute each time...grr...LOL! Here's a link to a video of the Speed Knitting competition for the International Champions (from the left: Canada, Netherlands, U.K., U.S. & France) at the Knit Out 2008. I bet that class with the Harlot was super fun! can't wait to see your new knitting technique! 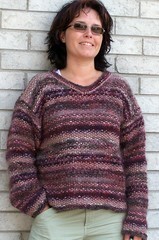 This is cosmic, like the sideways fiber in the carder. i have to get to Madrona. I watched the videos and have tried the speed knitting--habits are hard to break but I can see that this is worth doing. I alternate now between continental and English depending on how i feel and what I am doing---but this adds a new dimension. I never asked myself why i kept my left index finger up when i was knitting continental. Thanks everyone -- @Wanietta, that video is a cool one -- I couldn't find it, but SPM showed it to us in class, so I'm glad for the link. Great "study" material. Lucky us, we have Wannietta training us our team Wool Challenge meeting this very afternoon!! This way we can hope to keep the world title in the International Back-to-Back Wool Challenge for a third year running. Good grief. I've never seen anything like this. Like any one of them actually. I certainly do have a looooooooong way to go. Pit knitting. The fastest knitters are pit knitters. I have had a bolt of lightening hit me. I knit like a turtle compared to them! Amelia, I have been knitting this way (lever) as long as I can remember! This is why I see no point in "switching to Continental" as many have advised me! I don't hold the needles "pencil style" as Stephanie does, though. In any event, it's very easy on the hands, elbows, shoulders, whatever! Fascinating videos, I don't think I'll ever be in the running for this type of competition, I have the wrong sort of hands with dodgy joints. I look forward to hearing how you get on with this. I'm not finding it easy to see what's going on in any of these videos. Drat!!! And do tell, what is this miraculous SSK that Stephanie taught you?!!! The awesome SSK: enter first stitch as if to knit; continue on to the second stitch, entering it THROUGH THE BACK LOOP, then knit both together. SSK Done! I knit at an average of 1 stich per second for garter and stockinette but for cables and lace and stuff including colorwork I significantly slow down from 1 stitch per second.